“You win best scream,” the mixed group of Americans and Canadians told me as I stumbled, still shaking, onto the lower of the two wooden platforms in the rainforest. I turned to Kerri, eyes wide. “I don’t even remember screaming,” I whispered. We were high in the Costa Rican canopy rainforests, spending the afternoon flying through the treetops by way of a series of long zip-lines. It was something I had always wanted to do; I thought about zip-lining in Southeast Asia and other parts of Central America, but I heard time and time again that Costa Rica offered the most stunning views and the most exciting courses. For $38, we decided to go with Monteverde Extremo, a company that promised an adrenaline-packed time. They definitely made good on that promise. After collecting a small van full of other tourists, we rode from the town of Santa Elena into the heart of the Monteverde canopies. We suited up, complete with lots of straps and harnesses, thick gloves, and a helmet that we all observed would help little if we actually did fall from the 300-metre-plus heights. We got a brief lesson on how to sit, zip, and stop, and then…we were off. Before we could even really comprehend what was happening, we were strapped in and zipping through the trees, low and short lines at first, but then – encompassing some of the most exhilarating moments of my life – we started the famously long lines, some over 1km long. We flew over sweeping valleys of green trees, mountains and volcanoes and Lake Arenal in the distance. We whooped and hollered as we soared – as Kerri said, it was perhaps the closest we would ever feel to actually flying. Once we were across the valley, we were introduced to the Tarzan Swing, the cause of my award-winning scream. Jumping off a tall platform in the trees, you free-fell for a few seconds before the ropes caught you and were swung out into the forest, very much like Tarzan. Apparently I let out a bloodcurdling shriek as I fell (which continued as I swung, too), but all I can remember is the massive rush of adrenaline I felt, the whoosh and the wind, the way my heart pumped madly for a solid five minutes after I was back on solid ground. To get back to the other side of the valley, we finished the day with the amazing Superman line; your feet are also attached to the line, forcing you to lie parallel with the ground. Arms out at your sides, it really was like being Superman, soaring over the trees. It was one of the most fun things I’ve ever done in my life, without a doubt. Each time we finished a line, Kerri and I would look at each other, our faces flushed and smiling, our hair wild under our helmets, our blood pumping and our spirits high. We felt incredible. We were made for adventure, her and I.
Zip-lining is so much fun! And what an awesome place to do it in!!! How could it not be awesome with a name like Monteverde Extremo? Zip-lining is still on my list, and this post just confirms that I must try it, and soon! Life should be full of opportunities to win “best scream”! Andi – I really didn’t anticipate that the Tarzan swing would be that scary! 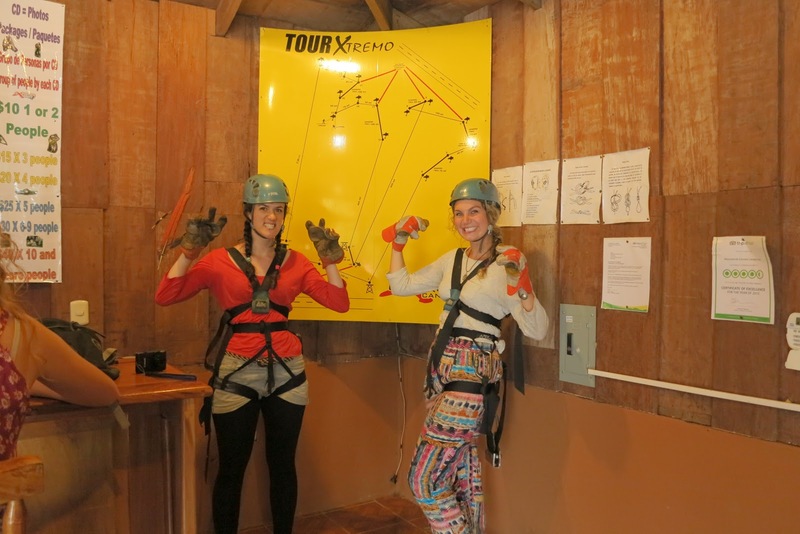 Katie – You should definitely try zip-lining when you get the chance! You’d love it…waterfall rappelling sounds incredible, too! Thanks for sharing these fantastic photos! I had my own zip lining experience in Oregon in the United States. Though it was not quite so beautiful and exotic as Costa Rica, it was certainly an exhilarating experience just the same. I remember not making a conscious decision to yell, but rather a scream was ripped from my throat as I soared along between the trees. I will never forget that momentary free fall sensation as I jumped off the platform before the line caught me and sent me zooming on my way. Ruth – Wow, thank you for sharing that story! Isn’t zip-lining amazing? ?